Steve Bullock for Governor. Say NO to Steve Bullock for Montana Governor. Steve Bullock: Steve Bullock for Governor. Say No to Steve Bullock for Montana Governor. 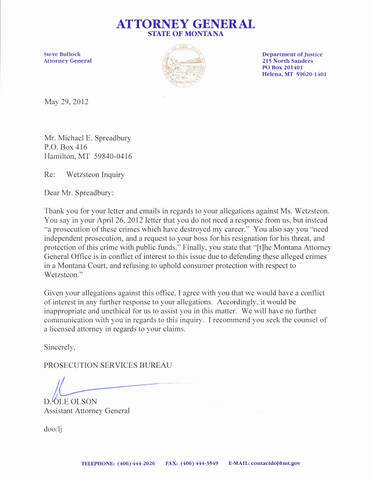 Following is an Open Letter to Montana Attorney General From Michael Spreadbury. I am a 4th Generation Montanan, I Say NO to Steve Bullock for Montana Governor. Steve Bullock for Governor; NO Way Steve Bullock for Governor. Steve Bullock for Governor. Steve Bullock for Governor. Say No to Steve Bullock for Montana Governor. Following is an Open Letter to Montana Attorney General From Michael Spreadbury. I am a 4th Generation Montanan, I Say NO to Steve Bullock for Montana Governor. Steve Bullock for Governor; NO Way Steve Bullock for Governor. Steve Bullock for Governor. Steve Bullock, Montana Attorney General has IGNORED the rights of the victims of Montana Corruption. Steve Bullock, Montana Attorney General, knows about Montana Corruption that violates our constitutional rights and denies our due process and Steve Bullock does NOTHING. Now Steve Bullock for Governor? Why in the World VOTE for Steve Bullock for Governor when Steve Bullock has protected corruption in Montana as our Attorney General and Steve Bullock protects the University of Montana to violate constitutional rights and allow Law Students, to seemingly violate the law. I Say No to Steve Bullock for Governor? Below is a Letter from Michael Spreadbury to Steve Bullock, Montana Attorney General who is Steve Bullock for Governor, Say No to Steve Bullock for Governor? I got the strangest letter in the mail today from your prosecution services. Mr. Olson agreed with me that your office has a conflict of interest, and asks me to find an attorney. I think I found you. You were the guy shaking hands with George Corn. You were the guy on the phone threatening my house, and my job a FEMA. You're hired. You carried out your threat with Angela Wetzsteon's unauthorized student practice. Your office needs to assign a prosecutor for the crime of prosecuting law without a license. Or should we tell all of the law students in Missoula that they are wasting their money at law school? Did you waste you money at law school? Does covering up felony crimes work for Montana to make it any better than it is? A crime was committed (Perjury, Fraud, Impersonation, falsification, violation of rights). Isn't the Montana Attorney General supposed to prosecute crimes? Isn't the Attorney General supposed to protect consumers from unauthorized practice? A call was made by your prosecution offices to the perpetrator to ask what their side of the story is. Nobody did that as I asked a librarian for help with sitting peacefully on public property. Don't we get federal monies in Montana? What are they for, to terrorize people? You forgot all of the medical marijuana voters hitting the polls--Your governor plans are up in smoke. PS Let me know how a private attorney will help me as this case has gone through the State Supreme Court, and the 9th circuit. Let me know how a private attorney can prosecute someone in Montana. While you are protecting crime, you ruined the reputation of a law student, and the integrity of your office. "On Februrary 9, 2011 Eric Holder the mastermind of destroying state medical marijuana laws spoke in the Montana Theater at the Univesity of Montana Missoula. Montana residents were ready to listen to Eric Holder, the US Attorney General who told the crowd that day medical marijuana would be respected. Steve Bullock had a chip on his shoulder as he heard Holder speak---because he knew that The US Attorney General was lying about respecting Montana's citizen initiative from 2004 legalizing medical marijuana. As the state voters will overturn the Montana Legislature in 2011, 2012 will be a strong year for the large voting block FOR medical marijuana in the United States. Montana is no different. As Steve Bullock knew of the raids in the spring of 2011 he did not count on the tide of voters who are upset with Steve Bullock not upholding Montana law. Steve Bullock saw the power in going along, instead of his sworn duty to uphold the law, no matter what the law said. 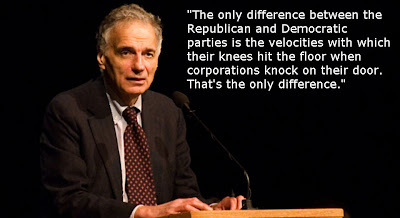 As a Nader operative in 2004 and issuing press releases with the campaign in 2004 to get medical marijuana passed in the State of Montana, the Democrats and Steve Bullock currently running for Governor have been left on the dock and the election boat has sailed. To criminalize marijuana after the people have accepted it as a medical savior for several painful conditions is political suicide. Steve Bullock, by not upholding our Montana law [he also did not respect election law, or unlawful practice, or other Montana victims: the elderly] he has committed political suicide in Montana and has no chance for Governor of Montana in 2012. Industrial hemp: The Nader campaign supports industrial hemp as a renewable resource with many important fuel, fiber, food, paper, energy and other uses. Industrial hemp is a commercial crop grown for its seed and fiber and the products made from them such as oil, seed cake, and hurds (stalk cores). Industrial hemp is one of the longest and strongest fibers in the plant kingdom, and it has had thousands of uses over the centuries. In need of alternative crops and aware of the growing market for industrial hemp—particularly for bio-composite products such as automobile parts, farmers in the United States are forced to watch from the sidelines while Canadian, French and Chinese farmers grow the crop and American manufacturers import it from them. Federal legislators, meanwhile, continue to ignore the issue of removing it from the DEA list. It is time to allow hemp agriculture, production and manufacturing in the United States. The letter also highlighted the rapid expansion of the prison system in the United States which now houses more than 2.1 million people – one-quarter of the world’s prison population. Clemency for non-violent drug offenders would save more than $1 billion annually. "It is urgent that the U.S. reverse the incarceration binge. The U.S.Department of Justice estimates that if incarceration rates remain unchanged an estimated 1 of every 20 Americans and greater than 1 in 4 African Americans can be expected to serve time in prison during their lifetime,” said Nader. "It is time to make the failed war on drugs a central issue in the American political dialogue. Steve Bullock is too dangerous with his power as Attorney General in Montana to allow him ultimate power over the Montana People as Governor in 2012. " Say NO to Steve Bullock for Governor of Montana. Say NO to Steve Bullock for Montana Governor.